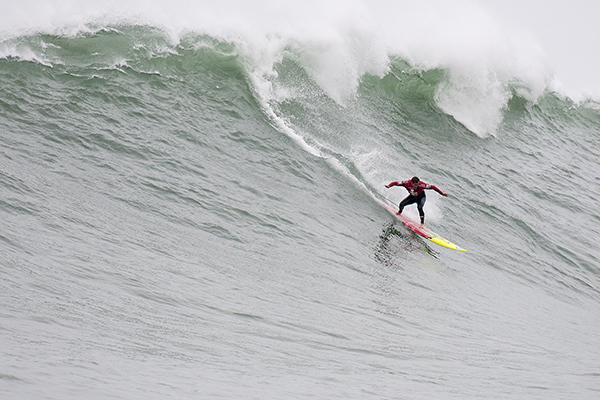 The World Surf League (WSL) Big Wave Tour (BWT) has placed the Billabong Pico Alto in Peru on Yellow Alert with a projected 20 – 30’ -plus swell heading towards the region with the expected arrival on Tuesday, July 21, 2015. Event organizers are closely monitoring a system that is travelling towards the area and the WSL will issue a Green Alert 72 hours prior to commencement if the event is called on. The Billabong Pico Alto in Peru along with the Puerto Escondido Challenge in Mexico and the Quiksilver Ceremonial in Chile, which has already run, comprise the Southern Hemisphere (swells generated off of Antarctica) half of the 2015/2016 BWT season. Commencing in October and November will be the Northern Hemisphere (swells produced in the Northern Hemisphere) half of the season that includes Lincoln City, Punta Galea, Pe’ahi and Todos Santos. The Billabong Pico Alto was the only Southern Hemisphere event last season to experience the required wave size, taking place on Thursday, July 3, 2014 in 40-foot waves where reigning WSL BWT Champion Makuakai Rothman (HAW) claimed his maiden victory. The primary swell of interest will be for early next week. Current model guidance has solid SSW/S swell building in quickly on Tuesday and peaking through the afternoon with 9-10′ of deepwater swell at 16-18 seconds. That would produce breaking waves in the 20-30’+ range on the face, with the largest sets of the day potentially up to 35-40′ faces. Should the event be called on the Billabong Pico Alto will be webcast LIVE via WorldSurfLeague.com.